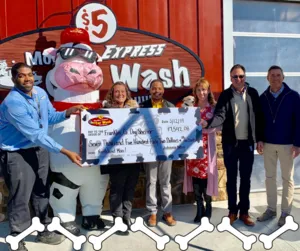 Moo Moo Express Car Wash in the Northland neighborhood of Columbus, OH has donated $7,542.08 to the Franklin County Dog Shelter. The donations were collected from Northland Moo customers at the company’s Grand Opening/Free Wash Week held February 14-20, 2019. During the Grand Opening, the wash offered a free “Crème De La Crème VIP” car wash ($18 value) to every customer in exchange for a monetary donation to the Franklin County Dog Shelter. Moo Moo also offered discounted retail gift cards with all proceeds donated back to the shelter. Throughout the weeklong Grand Opening, Moo Moo gave away more than 2,200 free car washes. “This donation is being designated for the shelter’s “SNYP IT, C-BUS Spay, and Neuter” program, an innovative program funded solely from private donations that provides free spay or neuter surgery to eligible Franklin County residents,” said John Roush, CEO of Express Wash Concepts and founding partner of Moo Moo Express Car Wash. Located less than a mile from the Northland Moo, the shelter rescued, reclaimed, or adopted out more than 10,000 dogs in 2018. In addition to providing compassionate care for impounded shelter animals, as well as adoption and lost dog services to the community, the shelter provides educational and community outreach programs including “Mingle With Our Mutts,” a community pet pantry for pet owners experiencing temporary financial difficulty providing food for their pets, and the spay and neuter program. Moo Moo Express currently operates in 16 Central Ohio communities including Bexley, Clintonville, Dublin, Gahanna, Grandview, Gove City, Heath, Hilliard, Lancaster, Marysville, Newark, Northland, Pickerington, Polaris, Reynoldsburg, and Upper Arlington. For more information, visit www.moomoocarwash.com.